Last June a team of 12 riders representing Edmundson Electrical, Midlands Region; Joe Roberts, Alan Bailey, Mike Burnard, Neil Smith, Phil Addis, Chris Platt, Paul Atkins, and their suppliers, including key sponsors Prysmian, cycled from London to Paris over 3 hard days to raise money for the Electrical Industries Charity (EIC) in aid of Caz Dickinson and her family. 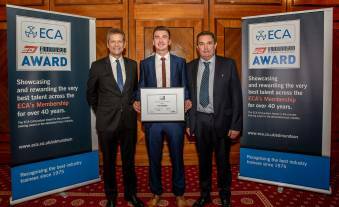 Pictured is 21-year-old Jack Teasdale of OPUS Building Services in Sunderland who is the winner of the 2018 ECA Edmundson Apprentice of the Year Award. 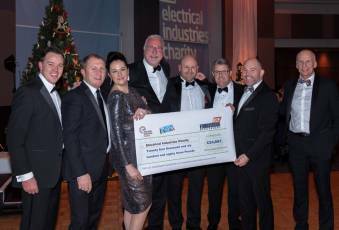 Also pictured Edmundson MD Mark Felber (left) and ECA president Malcolm Crofts (right). The announcement was made at a recent ceremony in London. Whilst just missing out on the top spot, Scott Coppola's Craig Arundel was delighted to have been judged one of the top 4 best Wholesaler Apprentices in Scotland. Schneider Electric discusses how to future proof today’s industry in the face of evolving workforces, technology and operations.